As an inveterate fan of the English language, I love spotting English - the more broken or misspelled the better - in books written in other languages, whether it's letters by Heinrich Graetz which keep spelling English words with "sch" for "sh" ("I schall take the honour to send the englisch translation of my "History of the Jews," as soon as it will be completely finisched.") or anything else, really. I have an extraordinary and wonderful example, which will be the subject of a future post, but in the meantime here's a nice one from מסורת התורה והנביאים (Vilna 1906) by Rabbi Pesach Finfer [sp? ], מו"ץ on the rabbinic court of that city. Note that there is no letter "W" in Italian (see here). See Founders of "Wissenschaft des Judentums" and America by Guido Kisch, p. 168 in Essays in American Jewish History (Cincinatti 1958). The V-W confusion in Italian sometimes goes the other way, too. 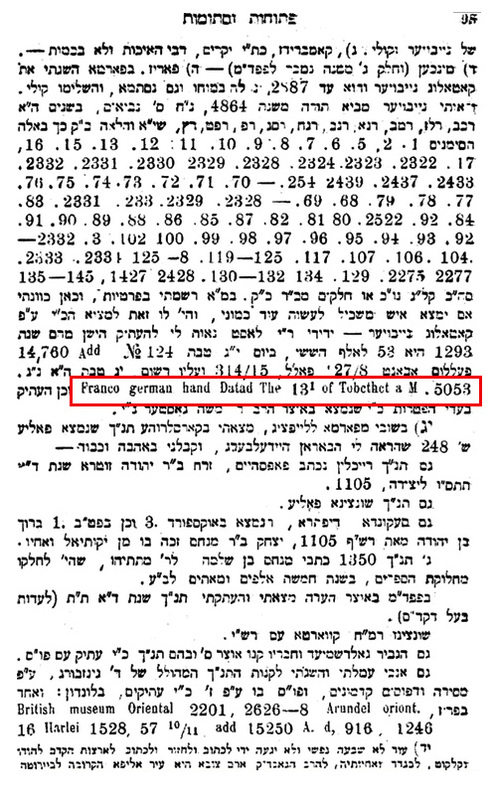 The original Trieste printing of Shadal's Hebrew perush on Bereshit contains contains the names "Wolney" and "Wriemoet," which should be "Volney" and "Vriemoet." Wery confusing. I once posted this motto from Romanelli's book (sh! I'm repeating myself). That post was mainly about the Hebrew pronunciation of the Jews in Morocco, and I pointed out that Romanelli specifically refers to the English w.
By the way, I recently was able to purchase 4 of the 5 volumes of the Pentateuco. So that's fun. Schurely you mean: "Sch! I'm repeating myself"
Oh, forgot to mention this earlier (or rather, didn't notice that you had asked): It's Pinfer. I've actually read the introduction to the book, a few years ago. I thought it might be myself, but checking in how the sefer was reviewed/ received at the time, they wrote Finfer. Did the author give a pintele in the Peh? I don't remember. Also don't remember how I know that it's Pinfer; I remember having to figure it out at some point. But now I'm second-guessing myself.